Wouldn't Trump's Wall Cede The Rio Grande To Mexico ? "The Rio Grande, what side of the river are you going to put the wall? 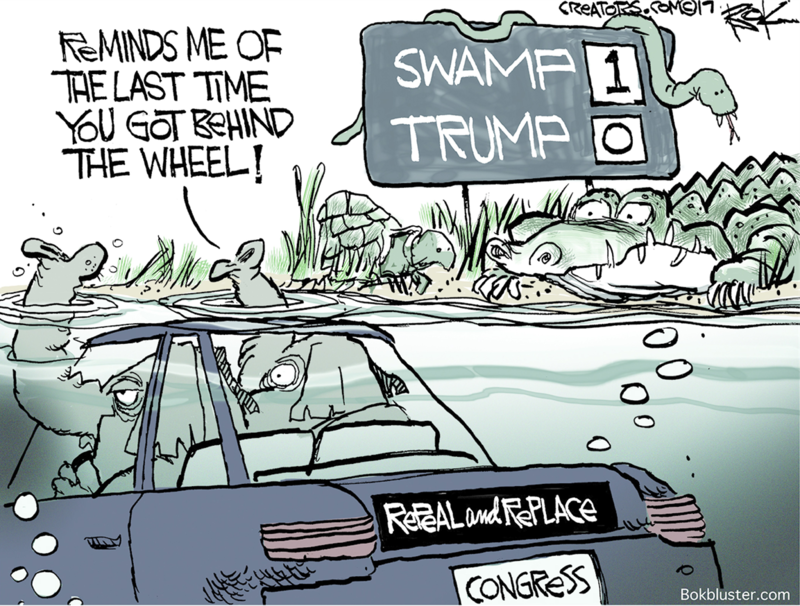 We're not going to put it on our side and cede the river to Mexico. And we're probably not going to put it in the middle of the river." That may sound like he's suggesting the wall be built on Mexico's side of the river. Not true. That would amount to an invasion of Mexico, and the seizure of some of their territory -- and just like Mexico is not going to pay for the wall, they would never allow us to build it on their sovereign territory. 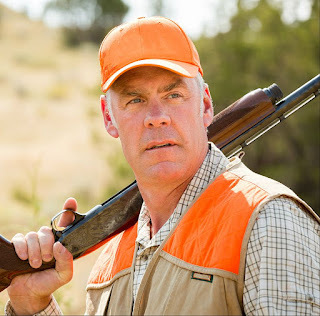 Zinke was pointing out just how complicated building a wall would be. If we built it on our side of the Rio Grande, then we would actually be ceding the river to Mexico (in effect, if not legally) -- because Mexicans would have free access to the river (right up to their side of the wall), while Americans would have their access to the river cut off. Since the admission of Texas to the Union, the United States and Mexico have shared access to and water from the Rio Grande River. Trump's wall would fundamentally alter that. Is this what Americans want? Have the Washington politicians (other than Zinke) even thought about this? After getting in trouble about repealing Obamacare, Trump stated that he didn't understand how complicated the issue was. I submit that building this silly wall is just as complicated an issue, and Trump has yet to understand that. In addition to effectively ceding the river to Mexico, the wall would also affect border commerce, affect the region's environment, cost over $20 billion (at a time when we have trillions in debt), raise issues of eminent domain, and probably be ineffective in controlling the immigration of the undocumented. It's a simplistic idea that would create more problems than it would solve. 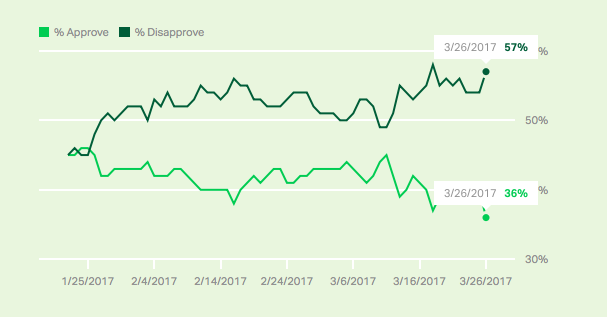 Trump's job approval rating continues to go down in the Gallup Daily Tracking Poll (actually a 3-day average of 1500 voters questioned each day). It currently rests at a dismal 35% (with 59% disapproving). That's amazing, and is lower than any president in their first year. 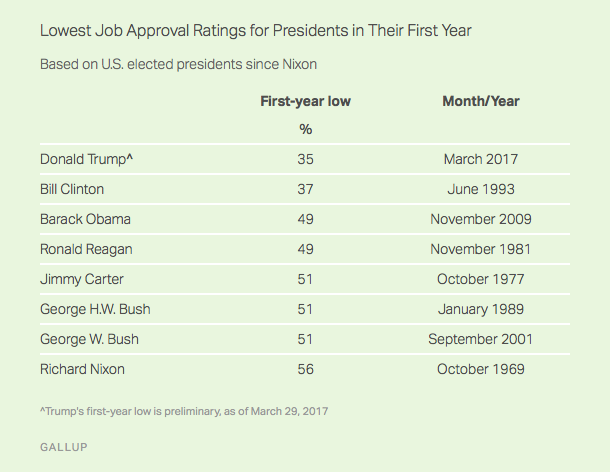 The previous low was Bill Clinton at 37% -- but it took Clinton six months to get an approval that low, while Trump has achieved it in only two months. I continue to believe this is an administration in deep trouble. The chart below shows Trump job approval in all recent polls. 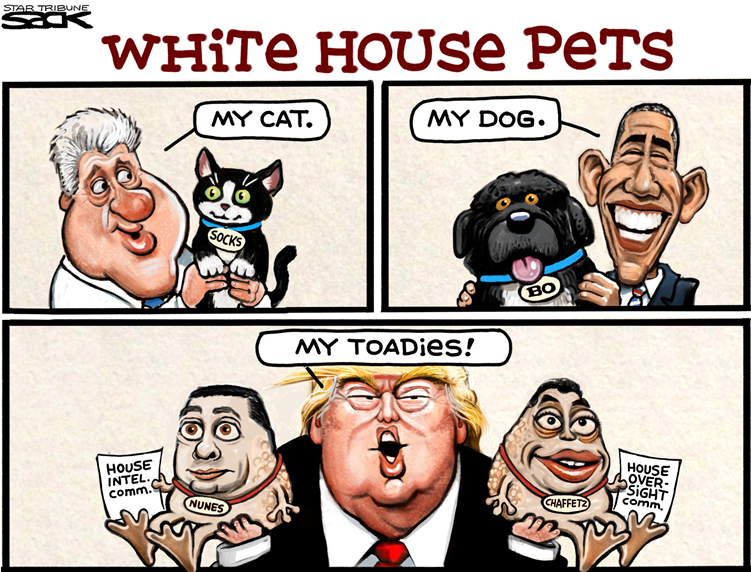 It is from RealClearPolitics. The RCP average of all the polls shows disapproval at 53% and approval at 41.4%. These charts were made from results of the newest Public Policy Polling survey -- done on March 27th and 28th of a random national sample of 677 registered voters, with a 3.8 point margin of error. 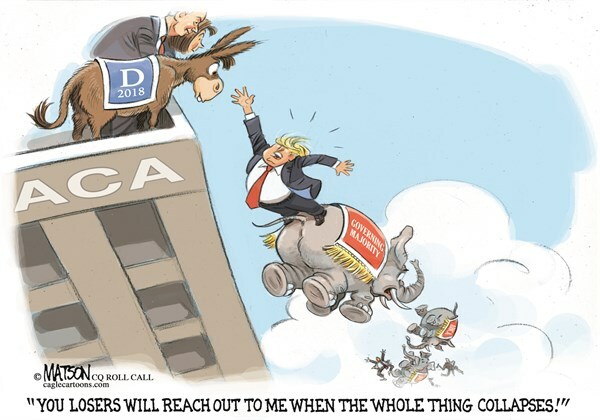 It shows that any of five different Democrats would beat Donald Trump if the election was held right now. 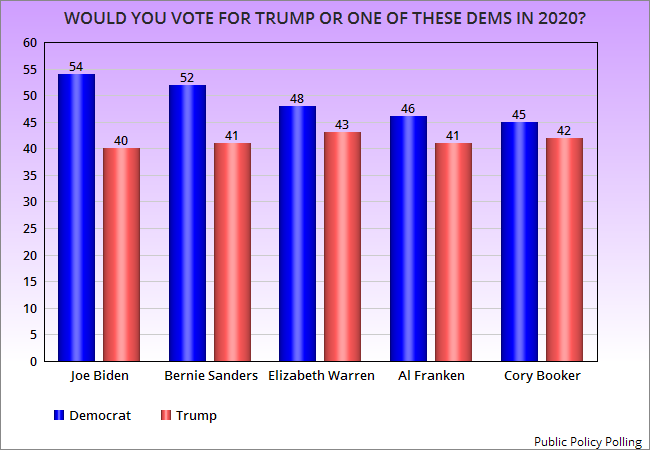 The favorite though is Joe Biden -- who has a 14 point margin over Trump. 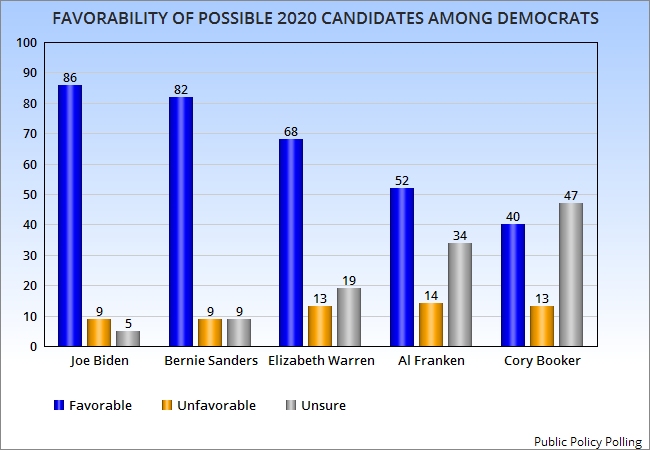 The others are Bernie Sanders (11 point margin), Elizabeth Warren (5 point margin), Al Franken (5 point margin), and Cory Booker (3 point margin). So, who is the favorite among Democrats? That would also be Joe Biden (see chart below). He has the highest favorable rating -- and the lowest unfavorable and unsure ratings. He has to be considered the favorite right now. NOTE -- I wish they had included Caroline Kennedy in this survey. 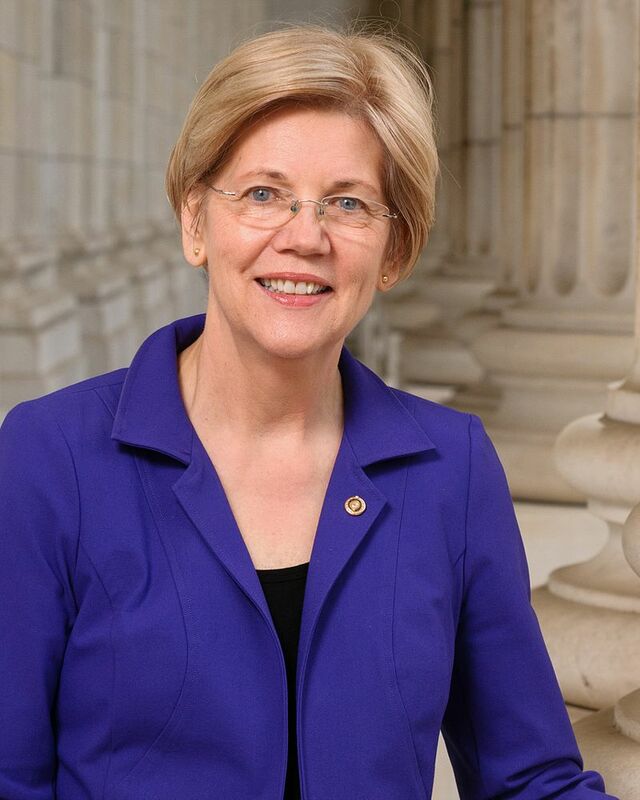 I think she would have scored right up there with Biden. One of the few things that Donald Trump seems to enjoy more than taking taxpayer-funded trips to his fancy hotels and golf courses is attacking me. But when Donald Trump goes on Fox News to call me angry — he's telling the truth. 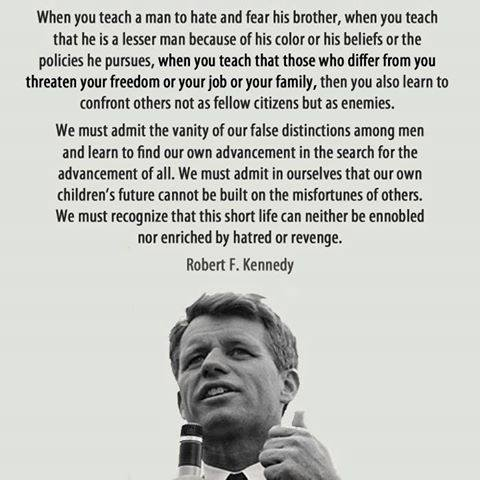 I am angry, Mr. President, and I'm not the only one. 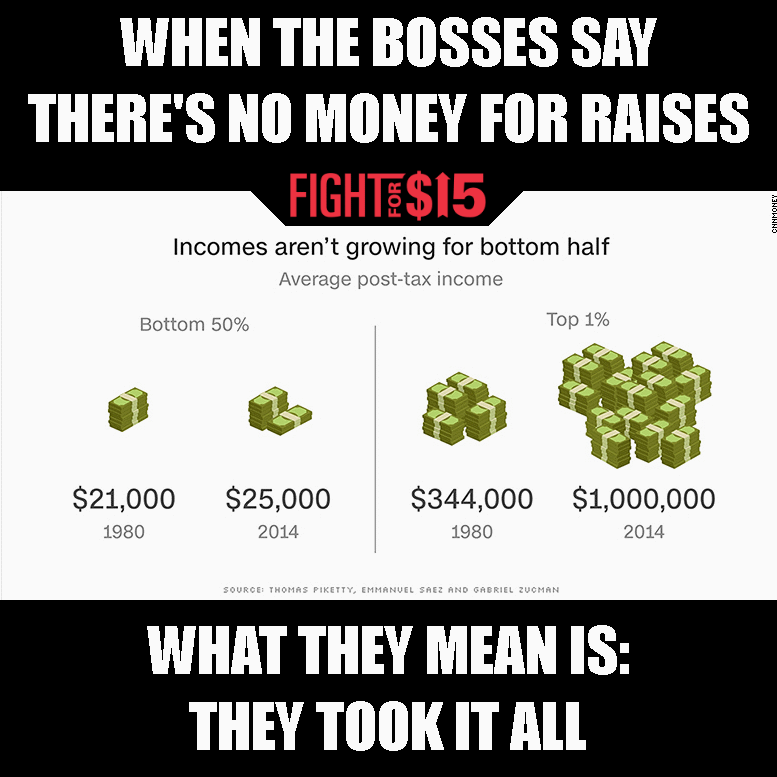 Millions of Americans in Massachusetts and across this country are angry that Trump and the Republicans are working their shriveled little hearts out to rig the system even more for the rich and powerful. They're angry, and they're ready to do something about it. 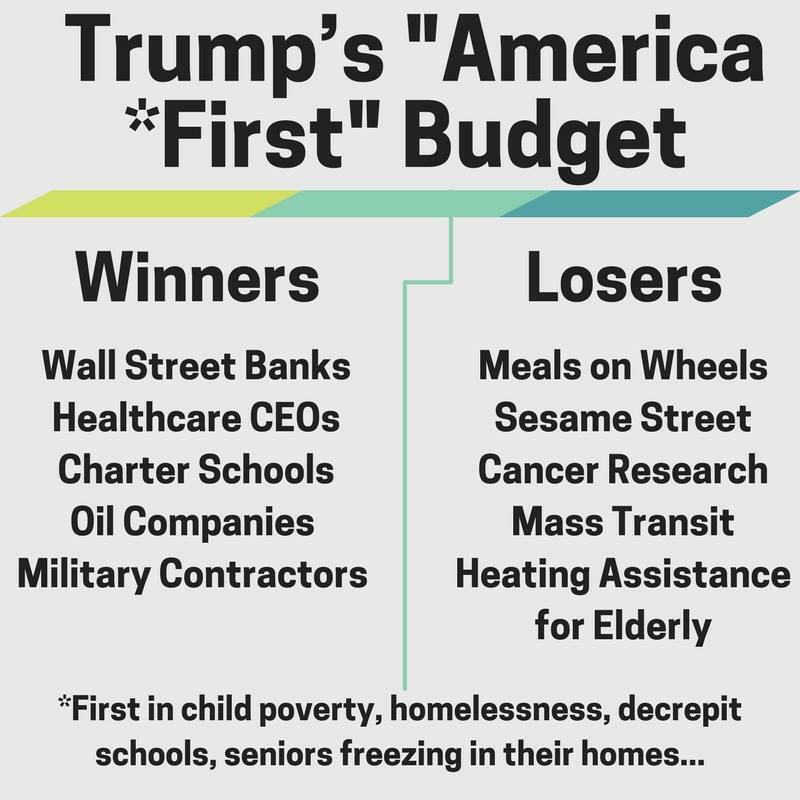 Americans are angry that Donald Trump's trying to give huge tax breaks for billionaires — but his first budget guts Meals on Wheels for seniors, slashes Pell Grants for students, devastates funding for NIH medical research, and cuts programs at the Environmental Protection Agency. And Americans are angry that after nearly a year of blocking President Obama's Supreme Court nominee, the Senate is now considering a judge whose record shows that he cares more about the rights of giant corporations than the rights of women, the rights of workers, and the rights of consumers. But here's the good news: Last week, we saw what happens when Americans turn their anger into action. 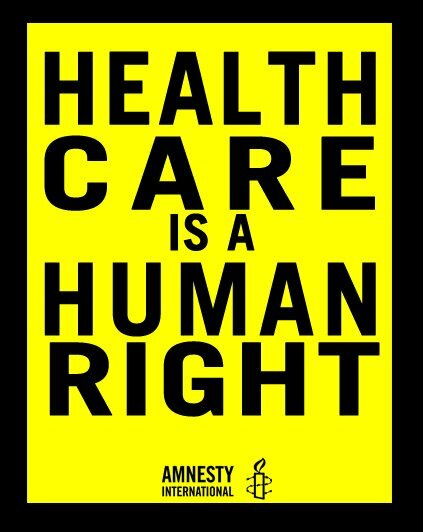 When Republicans tried to push through TrumpCare — which would have cost 24 million people their health insurance — you stood up, rallied, called your representatives, and made a difference. You inspire me, and I've never been more honored to keep fighting side-by-side with you. We're going to need to work together. Donald Trump, Mitch McConnell, and their SuperPACs are going to make Massachusetts a top target in 2018. Their attacks are going to get worse. A LOT worse. Political Cartoon is by Trend van Dam at cagle.com. 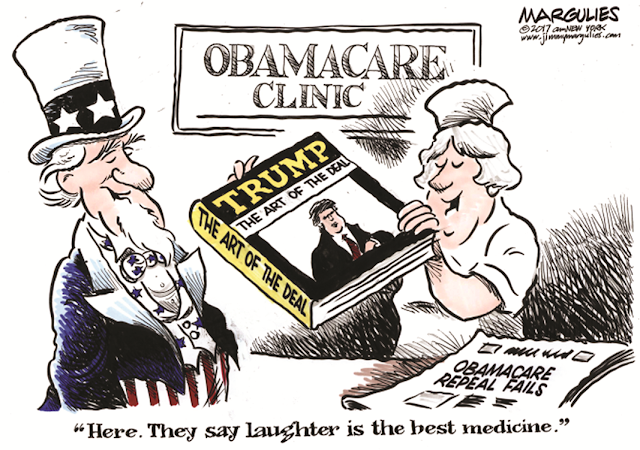 The Republicans recently suffered a defeat, when the "repeal and replace" of Obamacare (which they have been promising for the last seven years) was withdrawn from consideration in the House before a vote could even be taken. Even though the GOP has a substantial majority in that body, they could not agree of a plan to replace Obamacare. 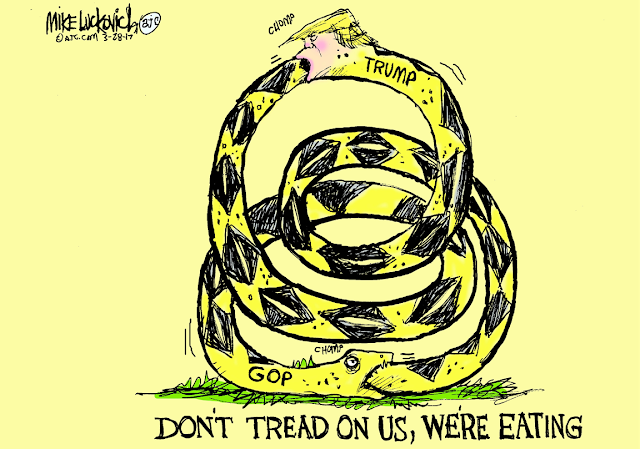 This week, Speaker Ryan tried to placate the teabagger base of the Republican Party. 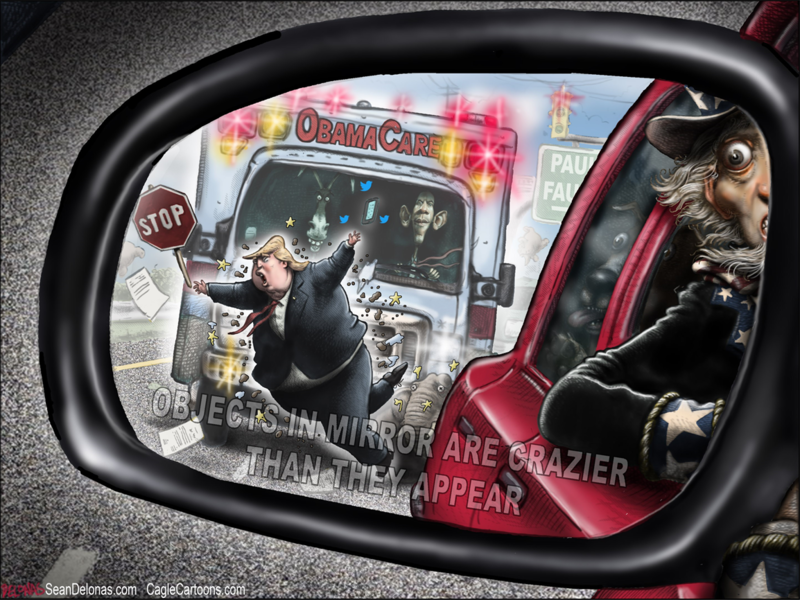 He assured them that the repeal and replacement of Obamacare was still on the Republican agenda. That was pure political theater. 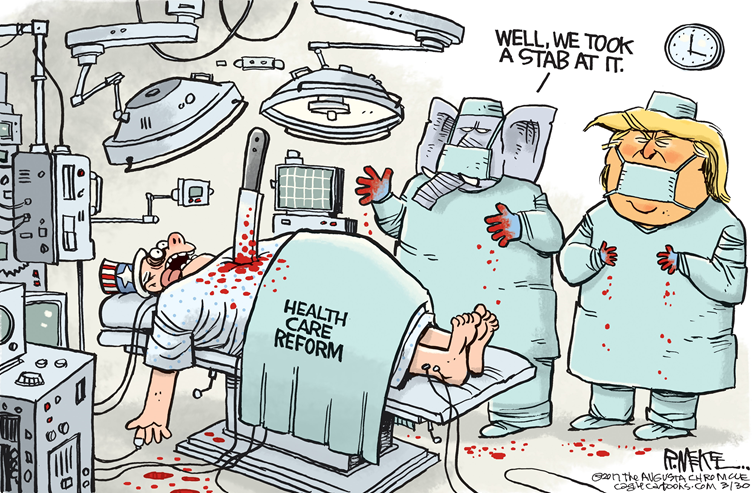 The GOP has had seven years to come up with a plan to replace Obamacare -- and they've been unable to agree on any plan. 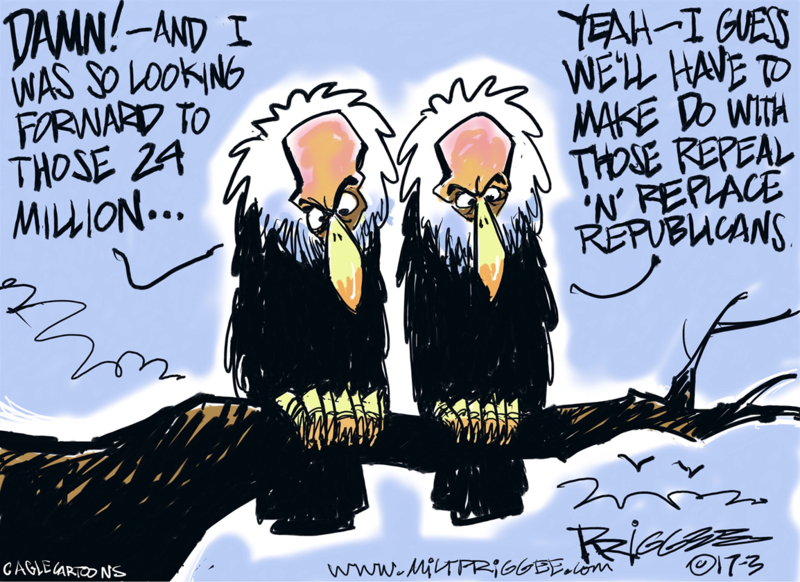 There is no reason to believe they can now create a plan that can satisfy both moderate right-wingers and extreme right-wingers (freedom caucus). Adding to their woes is the fact that the American public wants to move on to other issues, and leave Obamacare in place. That's the wishes of 51%, while only 37% want the repeal effort to be resurrected. That includes both Independents (by a 19 point margin) and Democrats (by a 52 point margin). 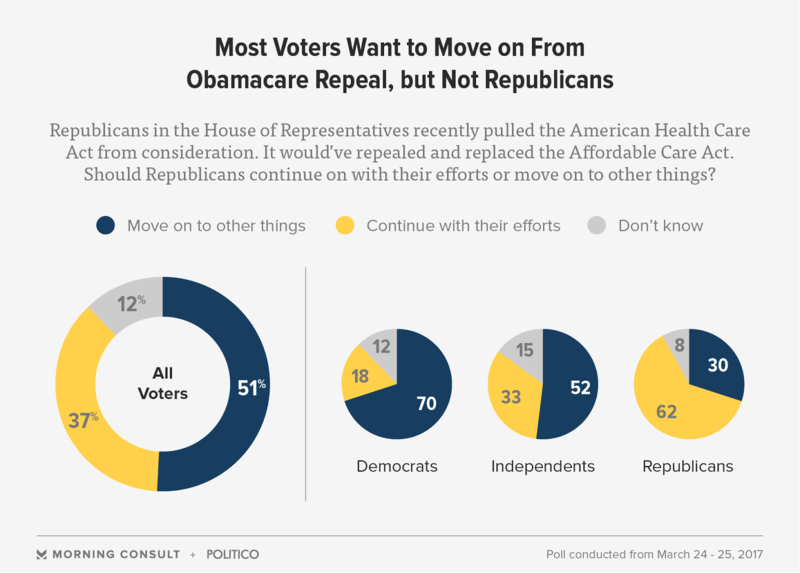 By a 32 point margin, Republicans would like repeal to be resurrected. But I suspect it's just to erase the ignominy of the defeat their party suffered, since most of them don't want repeal without a replacement plan -- and no such plan is in existence right now. The chart above is from the Morning Consult Poll -- done on March 24th and 25th of a random national sample of 1,991 registered voters, with a 2 point margin of error. The Gallup Daily Tacking Poll had Trump's job approval at 36%. 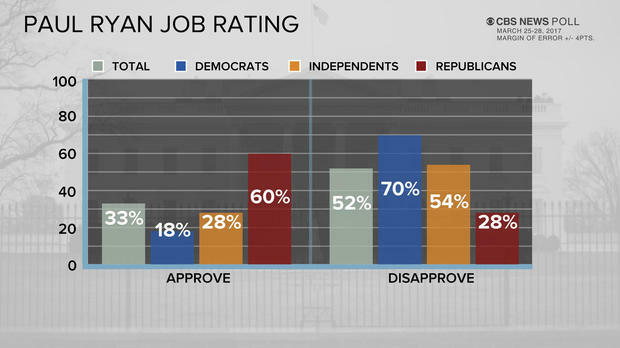 The latest CBS News Poll shows it only slightly better -- 40% approval and 52% disapproval. That's still a miserably low approval rating for a new president. 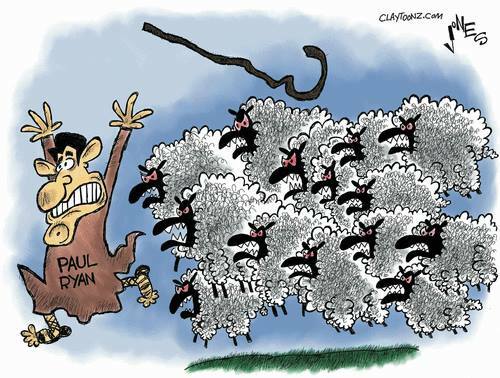 But it turns out that there's another Republican with an even worse job approval rating -- Speaker Paul Ryan. Ryan has a job approval of only 33% (and disapproval of 52%). Ryan's disapproval comes from Independents (285 to 54%) and Democrats (18% to 70%). Republicans approve of Ryan (60% to 28%), but that approval is lower than what they give to Trump (84% to 12%). Especially important is the view of Independents -- who have a poor view of both Trump (34% to 56%) and Ryan (28% to 54%). In swing House districts for the 2018 election, it is these Independents who will determine which party wins a seat -- and if Ryan and Trump cannot improve on these numbers, it could spell disaster for the House majority (especially since the party of a sitting president traditionally loses seats in the House anyway). These charts are from a CBS News Poll -- done between March 25th and 28th of a random national sample of 1,088 adults, with a 4 point margin of error. To it's great shame, the United States remains the only developed nation that refuses to guarantee workers at least some paid medical leave. While a few employers offer some paid sick days and some offer paid medical leave for new parents, no business in the United States is required to do that -- and quite a few take advantage of that to offer nothing. In those businesses, an employee who gets sick or has a baby would lose their pay, and could lose their job completely. But while our Republican-controlled federal government does not want to require businesses to offer paid medical leave, that is not the feeling of the general public. 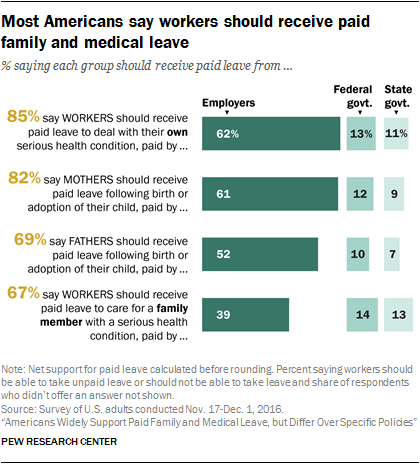 As the chart above shows, 85% believe workers should receive paid medical leave for a serious medical condition, 82% want mothers to receive paid leave after having a baby (and 69% would extend that to fathers also), and 67% say a worker should receive paid leave to help care for a family member. Who should pay for that medical leave. Members of both political parties say it should be employers rather than the government (and they like the idea of giving employers tax credits to do so). The public also believes guaranteeing paid medical leave would be good for the economy (65% to 34%), for families (94% to 4%), for women (93% to 5%), for men (87% to 11%), and for most employers (52% to 47%). 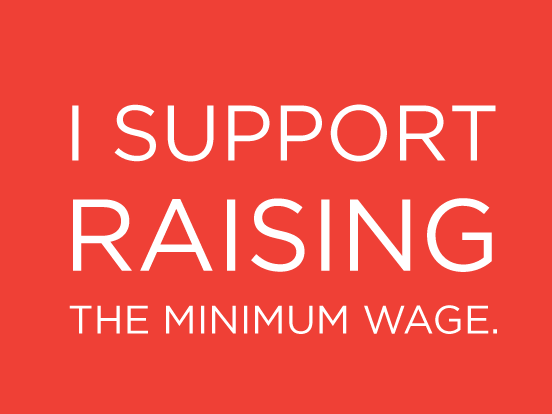 They do however say that it would not be good for small businesses (41% to 57%). 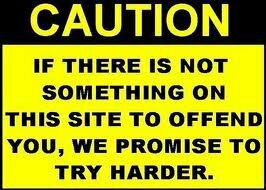 That could be addressed through some kind of government help for those small businesses. 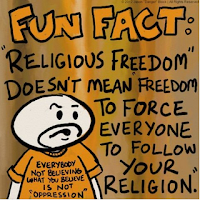 The charts above are from the Pew Research Center. The information is from two surveys done between November 17th and December 14th. The first queried 2,029 adults, and had a 2.3 point margin of error. The second questioned 5,934 adults, and had a 2.1 point margin of error. "Deaths of Despair" (deaths due to suicide, drugs, and alcohol) has risen sharply since 1999 among middle-aged Whites in the United States. And it is happening uniquely in this country -- with other developed nations showing a drop in those deaths or a leveling off in those deaths. That's the results shown in a new study by Anne Case and Angus Deaton published in the Brookings Papers on Economic Activity. 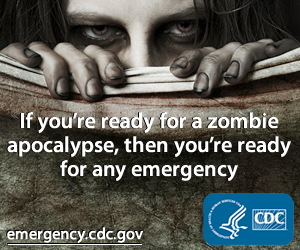 Why is this happening in the United States, and not in other developed countries? 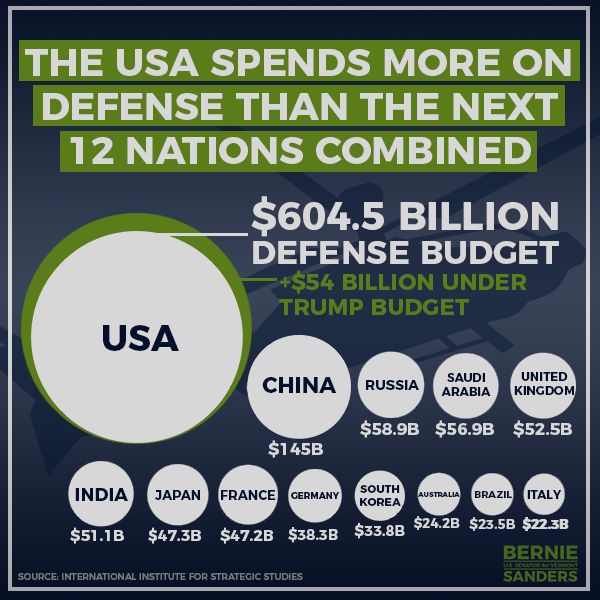 It's because the United States is the only developed country adhering to the "trickle-down" economic policy (the policy that says whatever is good for the rich and corporations is good for all Americans). That policy has tilted the economic playing field to favor the rich and corporations. 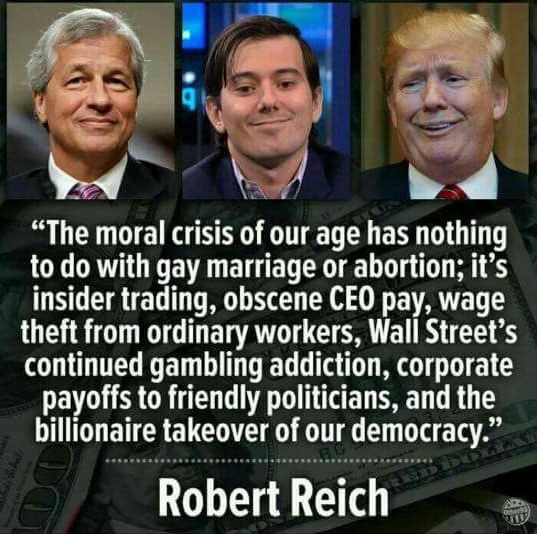 And it has resulted in stagnant wages and more job insecurity for all other Americans -- a fact that is particularly devastating among middle-aged Whites. Angus Deaton: Mortality rates have been going down forever. There's been a huge increase in life expectancy and reduction in mortality over 100 years or more, and then for all of this to suddenly go into reverse [for whites ages 45 to 54], we thought it must be wrong. We spent weeks checking out numbers because we just couldn't believe that this could have happened, or that if it had, someone else must have already noticed. It seems like we were right and that no one else had picked it up. We knew the proximate causes — we know what they were dying from. 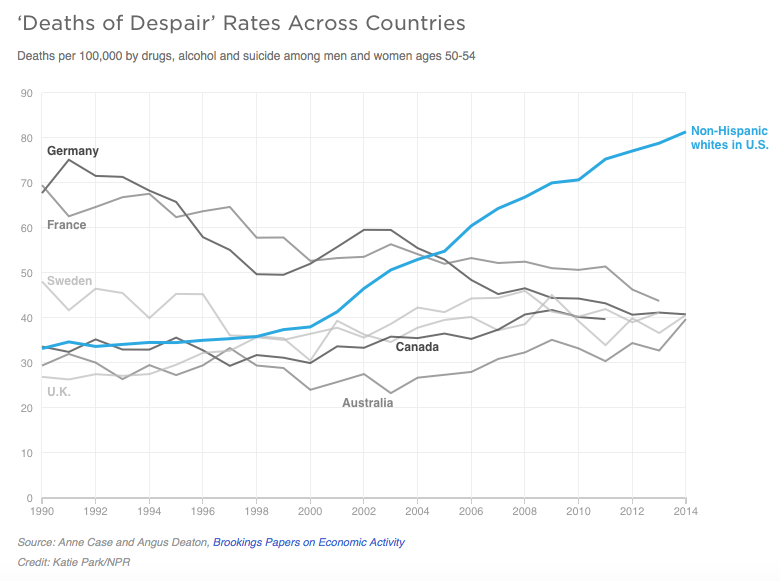 We knew suicides were going up rapidly, and that overdoses mostly from prescription drugs were going up, and that alcoholic liver disease was going up. The deeper questions were why those were happening — there's obviously some underlying malaise, reasons for which we [didn't] know. Anne Case: These deaths of despair have been accompanied by reduced labor force participation, reduced marriage rates, increases in reports of poor health and poor mental health. So we are beginning to thread a story in that it's possible that [the trend is] consistent with the labor market collapsing for people with less than a college degree. In turn, those people are being less able to form stable marriages, and in turn that has effects on the kind of economic and social supports that people need in order to thrive. 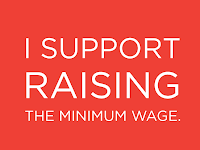 In general, the longer you're in the labor force, the more you earn — in part because you understand your job better and you're more efficient at your job, you've had on-the-job training, you belong to a union, and so your wages go up with age. 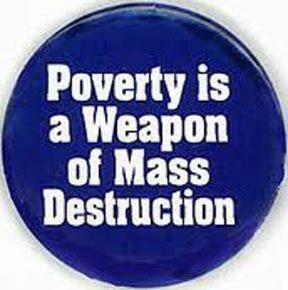 That's happened less and less the later and later you've been born and the later you enter this labor market. Deaton: We're thinking of this in terms of something that's been going on for a long time, something that's emerged as the iceberg has risen out of the water. We think of this as part of the decline of the white working class. 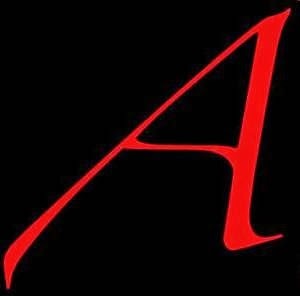 If you go back to the early '70s when you had the so-called blue-collar aristocrats, those jobs have slowly crumbled away and many more men are finding themselves in a much more hostile labor market with lower wages, lower quality and less permanent jobs. That's made it harder for them to get married. They don't get to know their own kids. There's a lot of social dysfunction building up over time. There's a sense that these people have lost this sense of status and belonging. And these are classic preconditions for suicide. Case: The rates of suicide are much higher among men [than women]. And drug overdoses and alcohol-related liver death are higher among men, too. But the [mortality] trends are identical for men and women with a high school degree or less. So we think of this as people, either quickly with a gun or slowly with drugs and alcohol, are killing themselves. Under that body count there's a lot of social dysfunction that we think ultimately we may be able to pin to poor job prospects over the life course. 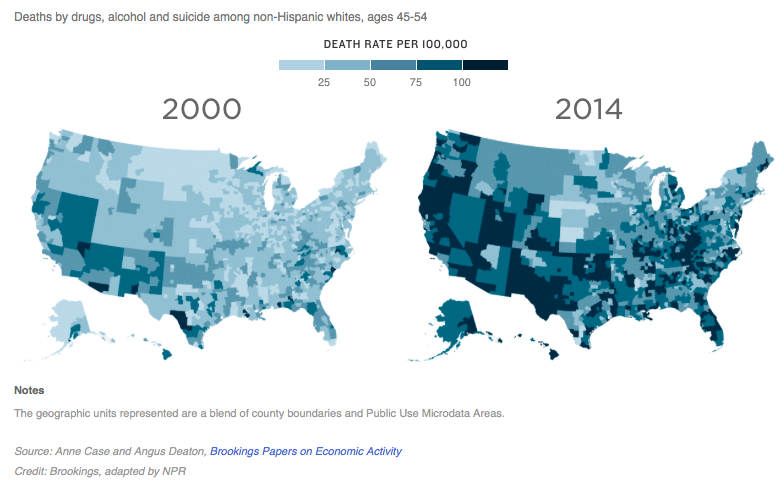 Deaton: Hispanics [have always had lower mortality rates] than whites. It's a bit of a puzzle that's not fully resolved, to put it mildly. It's always been true that mortality rates have been higher and life expectancy shorter for African-Americans than for whites. What is happening now is that gap is closing and, for some groups, it's actually crossed. What we see in the new work is if you compare whites with a high school degree or less, at least their mortality rates are now higher than mortality rates for African-Americans as a whole. If you compare whites with a high school degree or less with blacks with a high school degree or less, their mortality rates have converged. It's as if poorly educated whites have now taken over from blacks as the lowest rung of society in terms of mortality rates. 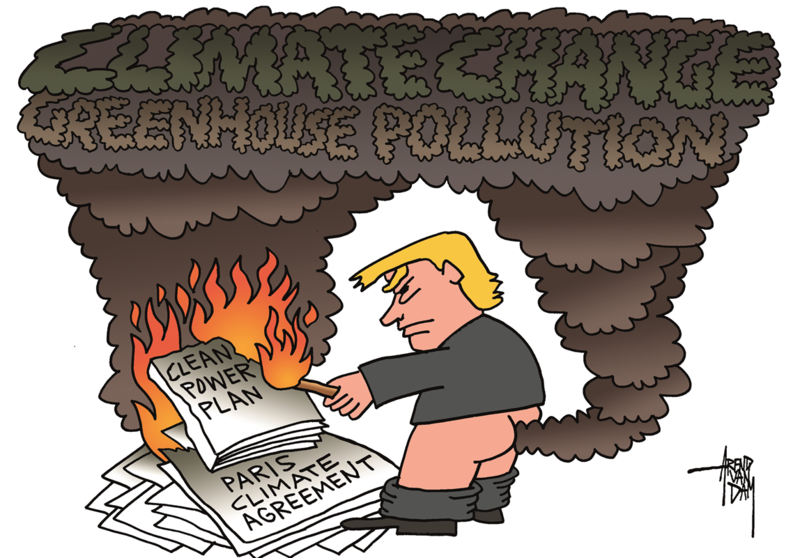 Since becoming president, Donald Trump has virtually declared war on this country's environment (and on the fight to curb global climate change). He put a man in charge of the Environmental Protection Agency (EPA) that doesn't believe in environmental regulations (and who has sued that agency at least 11 times to have regulations curbing fossil fuel pollution removed). 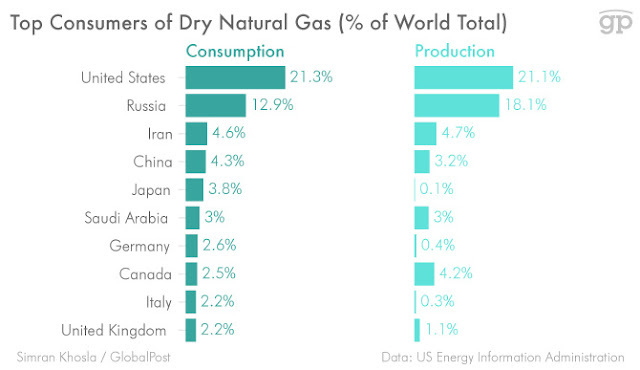 Then he put the head of one of the world's largest oil companies (Exxon) in place as Secretary of State -- assuring that this countries global policies will benefit fossil fuel production. That wasn't bad enough. 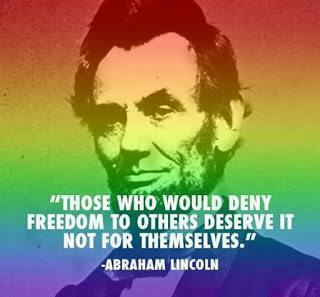 He then started issuing executive orders. 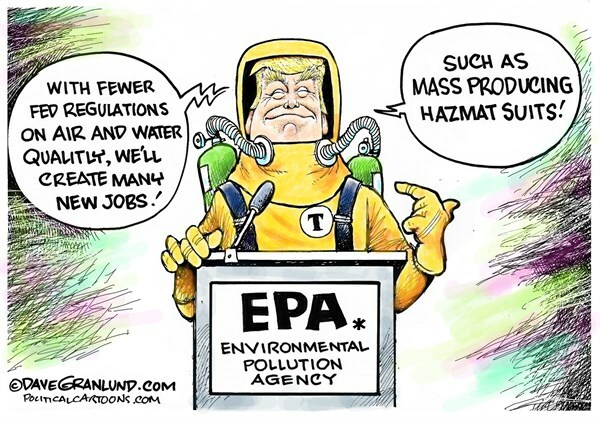 The first ones nullified a regulation that kept surface mining operations from polluting our rivers and streams, and set aside a rule that would have resulted in fossil fuel producers paying more in royalties to the federal government. Now he has issued a far more sweeping order. The new order lifts a moratorium on coal leasing, and removes the requirement that federal officials consider the impact on climate change when making decisions. This will increase production and use of coal (the dirtiest of the fossil fuels), and allow all fossil fuels producers to increase production without regard to what that does to the environment or to global climate change. 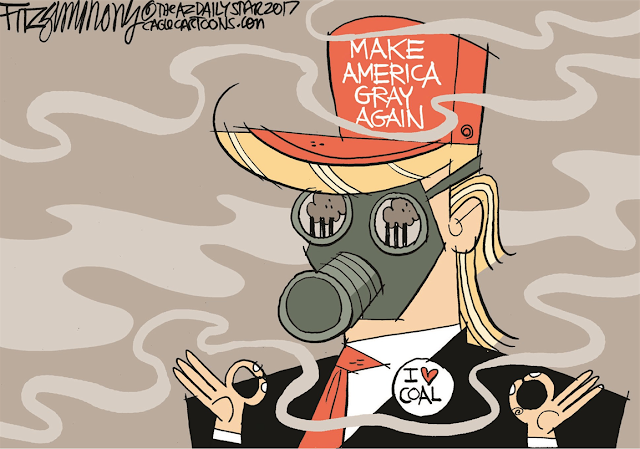 Trump seems determined to trash the environment for the benefit of his buddies who produce fossil fuels. And his actions send a signal to the rest of the world that the United States has no intention of honoring its agreement to curb actions that increase global climate change. 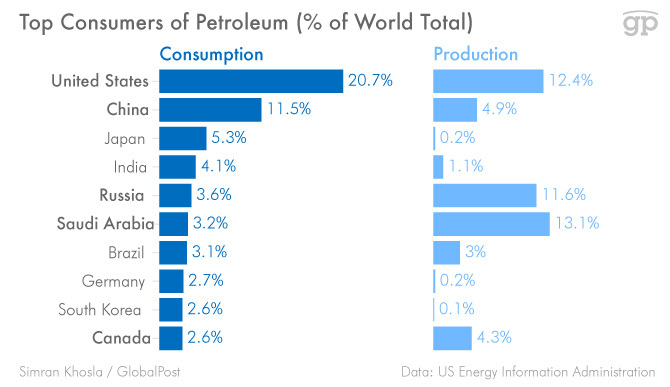 As the charts below show, the United States is the largest user of energy produced by oil and gas, and is second only to China in energy use from coal. 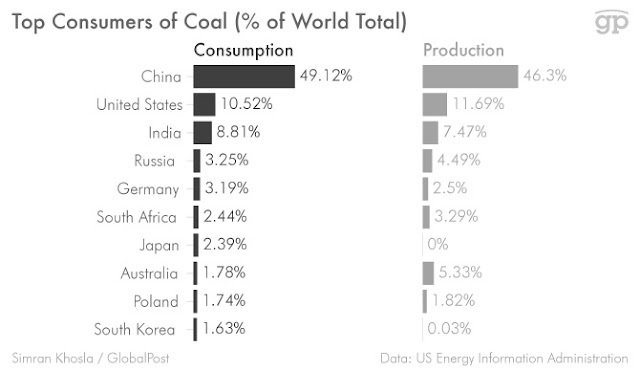 But while China is trying to curb its use of coal, Trump is taking this country in the opposite direction. 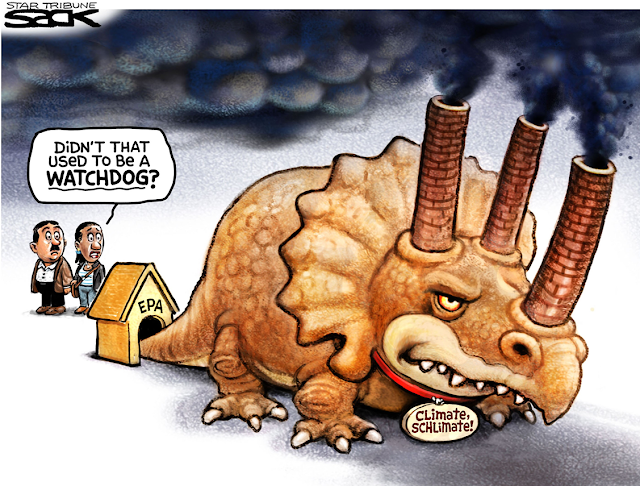 One has to ask, why should the rest of the world meet their obligations to curb global climate change? 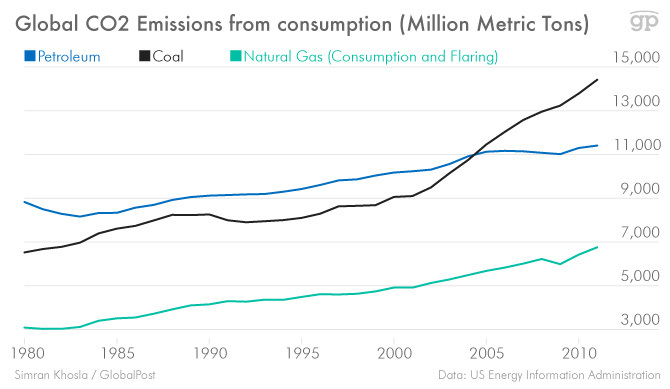 And even if they did meet their obligations, would it matter (since the U.S. is by far the largest user of fossil fuels energy)? The Trump administration is proving to be a real boon for the oil, gas, and coal industries (and other polluters) -- but it is a real disaster for human being (and the planet they live on). 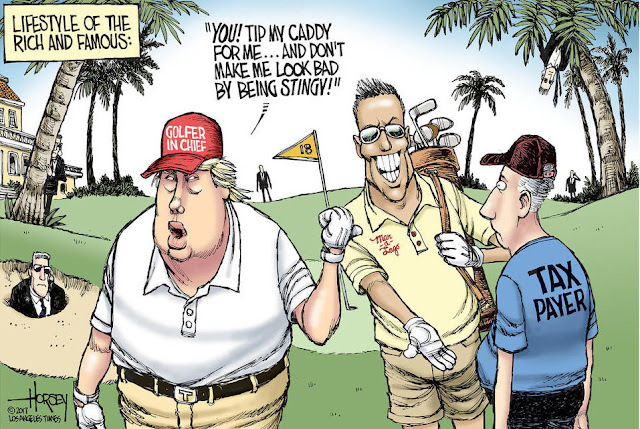 Political Cartoon is by Sean Delonas at seandelonas.com. Yesterday, I brought you the results of the Gallup Poll's daily three-day average of Donald Trump's job approval. It showed that his job approval had dropped to a record low of 36% -- lower than that of any modern president. Now the Gallup Poll has released their weekly job approval averages. And they look just as bad. 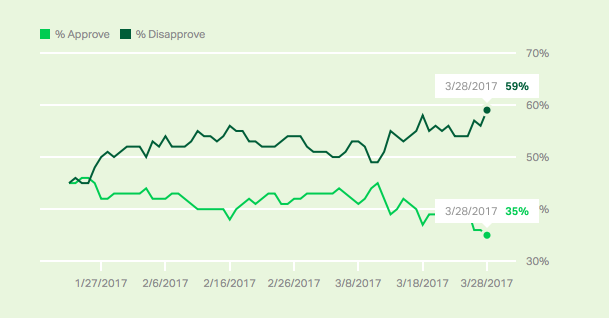 His weekly job approval is currently 39% -- and it has fallen by 4 points in just the last four weeks. 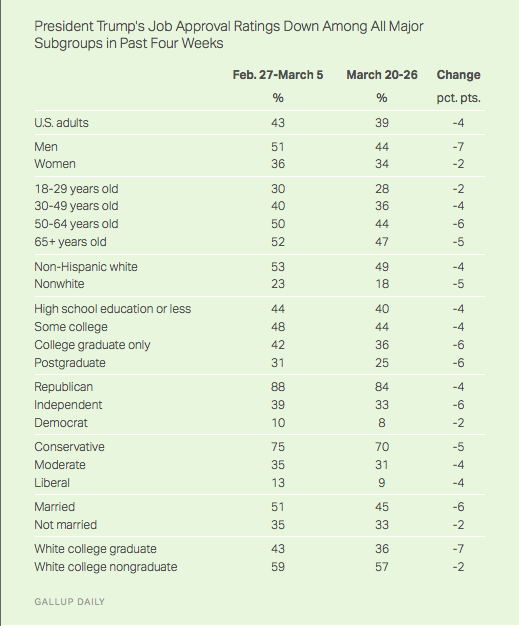 Even worse for Trump, his job approval has fallen in all groups -- even groups that support him (Republicans, conservatives, men, Whites, those over 50 years old, and those without a college degree). 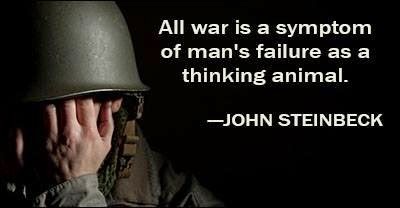 Are We Winning The "War On Terror" ? 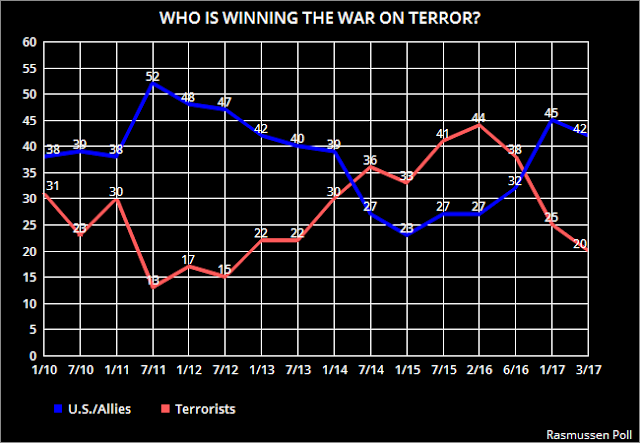 The chart above shows the public perception in the United States on who is winning the "war on terror" -- the United States and its allies or the terrorists. The polling is done by the Rasmussen Poll, and for each date 1,000 likely voters were questioned, with a margin of error of 3 points. 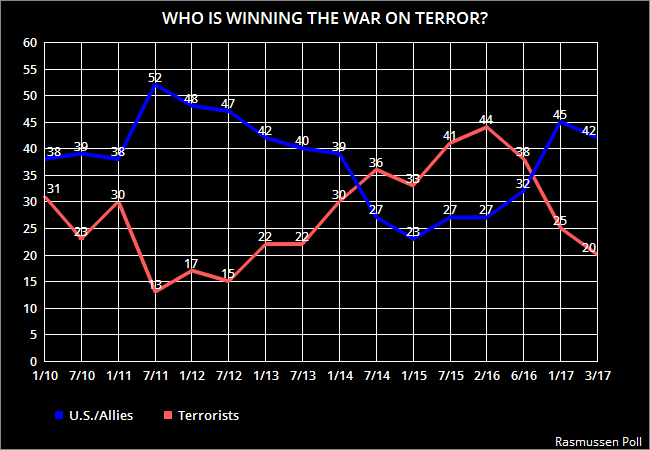 For the last couple of years, the public believed the terrorists were winning. That has now changed, and a plurality believes the U.S. and its allies are winning. Why the change? Is the public buoyed by the tough talk of our new president? Are we that easily fooled? The only thing that has changed since Trump took office is that we are doing more bombing -- and that increase in bombing is killing significantly more innocent civilians. In just the last two weeks, at least 279 innocent civilians have been killed by U.S. bombing. Is that really the path to victory over terrorism? Or is it just creating more terrorists? 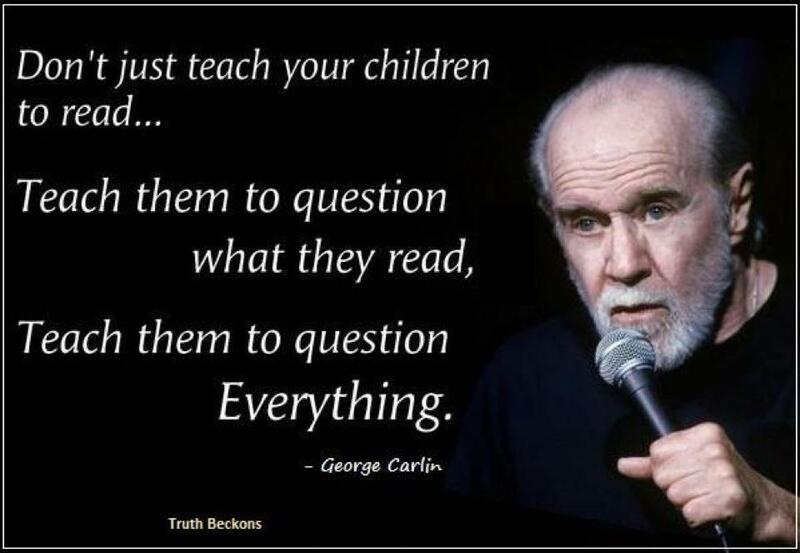 Maybe I'm wrong, but I think the latter is more likely. Political Cartoon is by Chip Bok at bokbluster.com. 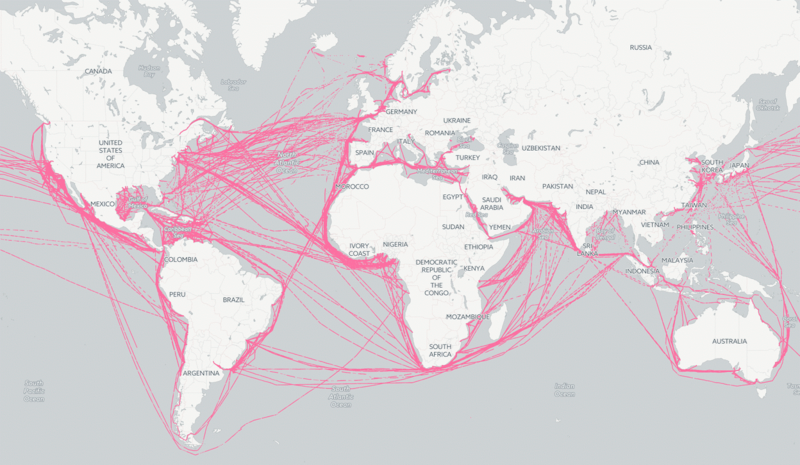 Each line represents the path of a ship in the Diamond S Shipping Group fleet in 2016. Commerce Secretary Wilbur Ross is a major investor in the company. When private equity billionaire Wilbur Ross Jr. signed on to be President Donald Trump’s commerce secretary, he agreed to divest millions of dollars in assets. But one asset Ross plans to keep is his stake in Diamond S Shipping Group Inc., one of the world’s largest owners and operators of medium-range tanker vessels, which crisscross the globe as crucial cogs in the transoceanic shipping trade. 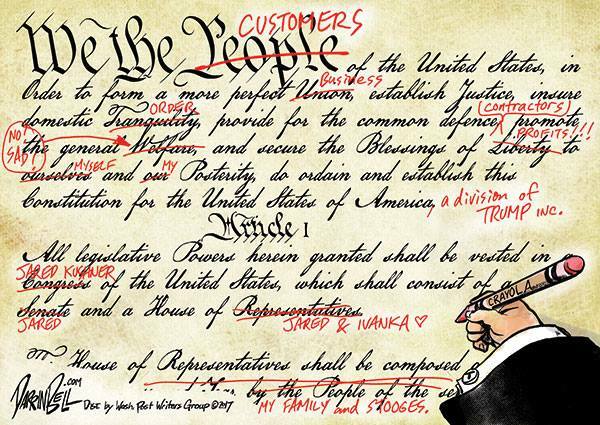 In a new administration full of successful businessmen dealing with a complex web of conflict-of-interest concerns, Ross’ part ownership of Diamond S Shipping stands out. A Center for Public Integrity examination of Diamond S Shipping’s operations found its vessels sail under Chinese flags, even as Ross is being tapped to take an unusually muscular role shaping U.S. trade policy under President Trump’s "America First" mantra. The company has ties to a major Chinese investment fund, and one of its ships has traveled to an Iranian port. Diamond S Shipping has also said it has — and may continue in the future to — “call on ports located in countries subject to sanctions and embargoes imposed by the U.S. government and countries identified … as state sponsors of terrorism, such as Cuba, Iran, Sudan and Syria,” according to its 2014 filingwith the Securities and Exchange Commission. And one of Diamond S Shipping’s main customers recently acquired a stake in a Russian national oil company. Ross has said he doesn’t believe the shipping investment presents a conflict. To take the Trump administration job, Ross agreed to step down from positions with the company, according to his ethics agreement, and plans to be a passive investor going forward. Ethics lawyers offered a range of opinions on potential conflicts presented by Ross’ Diamond S Shipping investment. Diamond S Shipping is based in Greenwich, Connecticut, but is incorporated offshore in the Marshall Islands. The company lists a total 45 tankers on its website. In 2011, Ross’ private equity company, WL Ross, led a coalition of investorsthat put about $1 billion into Diamond S Shipping. According to the company’s 2014 SEC filing, his private equity firm at the time was the company’s largest shareholder, with nearly one-third of the company’s shares. It is impossible to determine the exact value of Ross’ stake in the privately held Diamond S Shipping based on his government-mandated financial disclosures. 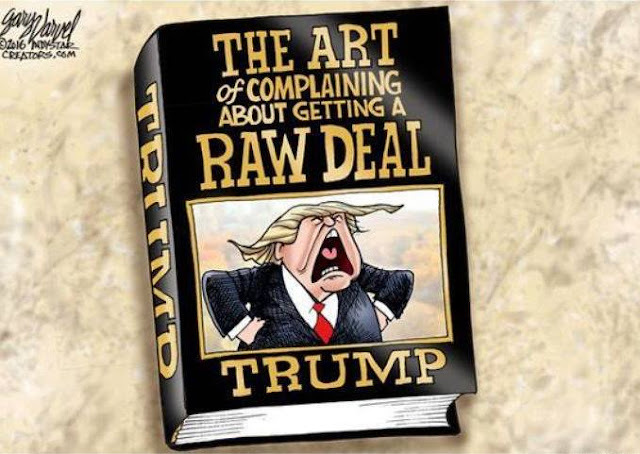 But the total value of assets he said he is not divesting, which includes investments in transoceanic shipping and real estate financing interests, together falls between $12.2 million and $36.5 million, according to the disclosures, which value assets within a range. Donald Trump made many promises during the presidential campaign -- none of which have been kept so far. 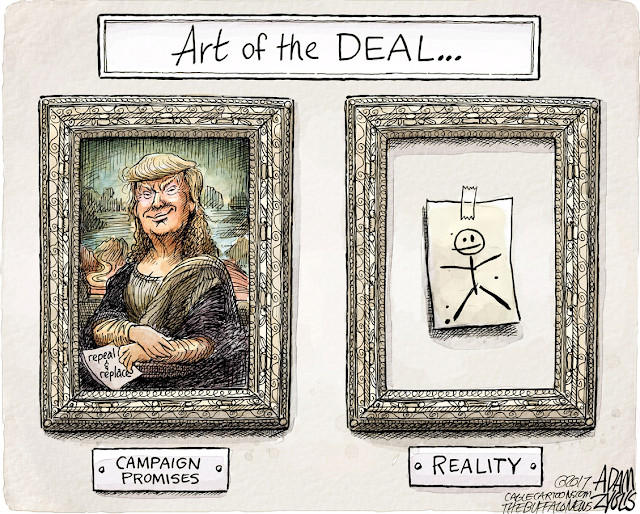 One of those promises was to be a uniter -- bringing Americans together for the good of the country. That's just another broken promise. If anything, Trump has been just the opposite of a uniter -- he's been a divider. Only 11% of the population believes he has made the country more united, while 34% say it has stayed the same and 52% say he has further divided the country. And those feelings are generally the same across gender, age, and racial lines (with far more saying he's been a divider than say he's been a uniter). 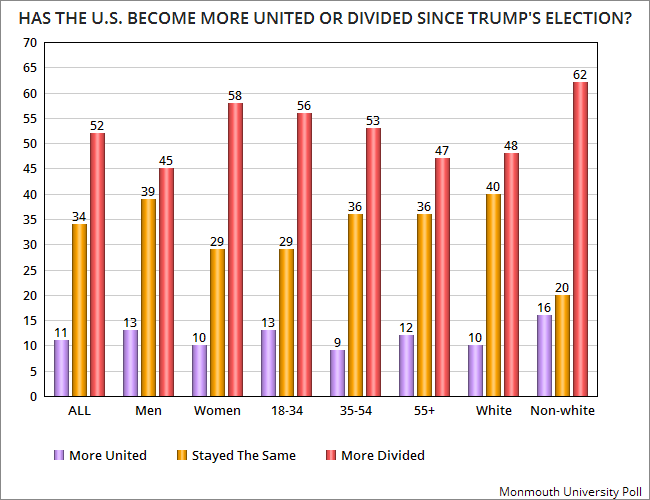 These numbers are from a recent Monmouth University Poll -- done between March 2nd and 5th of a random national sample of 801 adults, with a margin of error of 3.5 points. 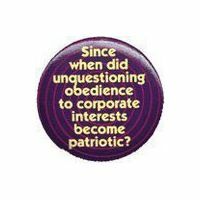 The Gallup Poll does daily tracking of a president's job approval -- questioning about 1,500 individuals. They then post an average of the last three days. The latest 3-day average for Donald Trump was 36% -- a record low for a president still in his first 90 days since Gallup has been doing this tracking. 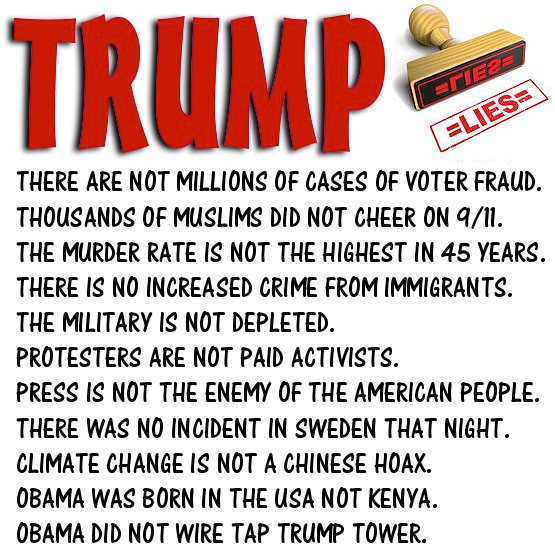 And it's not just Trump himself that the public disapproves of. 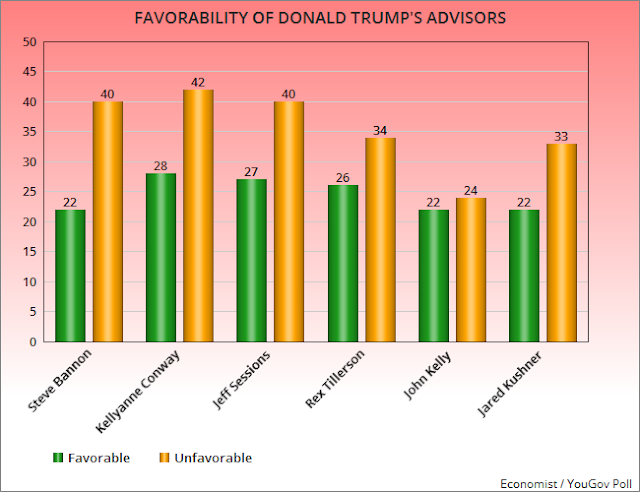 A recent Economist YouGov Poll (done between March 19th and 21st of a random national sample of 1,500 adults, with a 3.3 point margin of error) asked respondents if they had a favorable or unfavorable opinion of six of Trump's closest advisors -- Bannon, Conway, Sessions, Tillerson, Kelly, and Kushner (see chart below). All of them were upside-down in their numbers (meaning they were viewed unfavorably more than favorably). This is fast becoming not only the most unpopular president of modern times, but also the most unpopular administration of modern times.